Forty-nine hours and counting, which makes it the beginning of day three without Facebook. I didn’t really need it yesterday, so there’s something to be said about habits breaking after a couple of days. However, for work, I have needed to go on there: while Sopheak is covering for me as far as Lucire’s social media are concerned, I’m checking the finalists’ pages for Miss Universe New Zealand today. The problem now: many are coming up blank. Also it’s now impossible for someone to add me as an admin to their page (Facebook tells them I’m not a member and that it needs my email address). Facebook has been resolutely silent despite Tweets to them, which makes them worse than Google. At least Google has a support site where people lie to you, after which they go silent when they realize you have them over a barrel. At Facebook, you know you are getting ignored, and there’s no real way to file a bug report (if one of the bugs is you can’t post, then how can you post?). This bug appears to be spreading, if Twitter chatter is anything to go by, although things haven’t changed much at the unofficial forum at Get Satisfaction. However, I did find two posters at Get Satisfaction who have been out for six to eleven days. One Tweet of mine, strangely, did make it through as a cross-post; I wasn’t kidding when I said that being able to post is now the exception rather than the rule. (This, again, reminds me of the dying days of Vox.) But no one can like or comment on that post. If you’re a Facebook friend of mine, you can give it a go here. At least those who visit my wall and can see it (not everyone can) know something is up with Facebook, and that the site is, once again, broken. 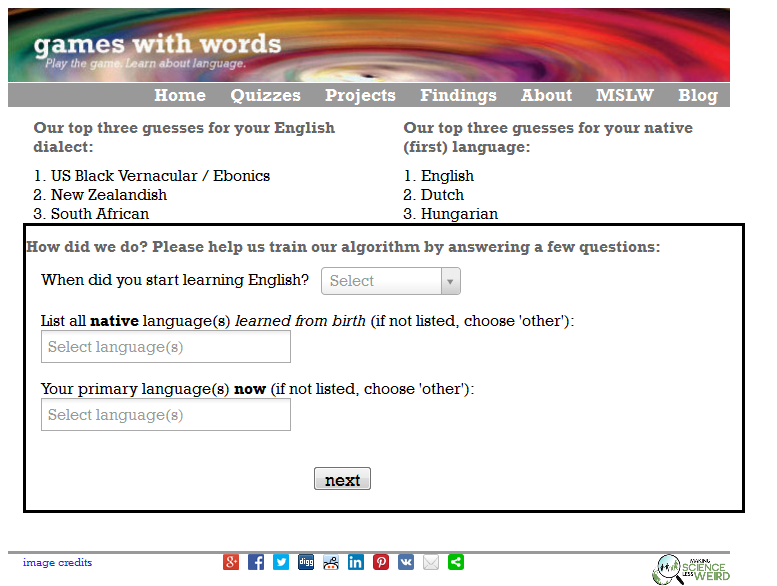 After completing the quiz, it made the following guesses about my English and what my first language is. It does appear my dialect is African American Vernacular English, and my first language is English. The second choice of dialect, ‘New Zealandish’, is an odd one: does this mean Australian? Or a bad impersonation of Kiwi (Ben Kingsley in Ender’s Game or, worse, Steve Guttenberg in Don’t Tell Her It’s Me)? There’s a possibility my mother tongue is Dutch or Hungarian. One out of six isn’t good, but I suppose I should be happy that we even come up in the survey, and that there are sufficient quirks to New Zealand English for it to be identified by an algorithm. One is allowed to feed in the correct details, so hopefully the algorithm improves and other Kiwis won’t have such way-out results. Or, it means that if our government wants someone to visit the White House, I am the ideal interpreter. My good friend and colleague Stanley Moss has written a new book, What Is a Brand?, which provokes some thought on the question in the title. Those who know Stanley and have followed his work know that each year, he issues a Brand Letter, which closes with various definitions of branding. If there’s one thing brand experts agree on, it’s the fact that no two brand experts will ever agree on the definition of a brand. What Is a Brand? turns this into its primary advantage, getting definitions from some of the top people in the profession, and somehow I managed to slip in there. Ian Ryder, Nicholas Ind, the late Colin Morley, Thomas Gad, Ava Hakim, Simon Paterson, Pierre d’Huy, Malcolm Allan, Patrick Harris, Tony Quinlan, Manas Fuloria, Steven Considine, Sascha Lötscher, George Rush, João Freire, Virginia James, Filippo Dellosso, the great Fritz Gottschalk, and others all contribute definitions, on which readers can ruminate. The aim of this book is to render brand thinking more accessible, to share with you the ideas of theorists and practitioners who bear witness to the evolution of policy and governance, especially in light of society’s drift towards overconsumption and environmental damage. It is now available as an e-book and as a paperback via Amazon.com, priced at US$5 and US$10 respectively. Keep calm and wear a tiara: I’m now also general counsel for Miss Universe New Zealand, on top of everything else. The news announcement went out yesterday—the Lucire article is here, while we have a new website at nextmissnz.com. The highlight is reducing the entry fee from NZ$3,500 to NZ$10 (plus a workshop, if selected, at NZ$199). We’ve had some great feedback over the website, which I am thrilled about, since I designed it and made sure all the requirements of the licence agreement were complied with. The year’s going to be a very exciting one with the competition, which will be far more transparent than it ever has been, with the possibility of its return to network television after a two-decade absence. We’re bringing integrity back into the process. From my point of view, the idea is one of business transformation, to take something that has languished and turn it into something that’s exciting, relevant, and 21st-century. With this development, I’m relieved I never published a word on the scandal last year and never went to the media over it (even if others did—often to their detriment). It makes it a lot easier to move forward with the future if you don’t keep dwelling on the past—and with the great programme we have, why should we look back? I’m looking forward to bringing you more with national director Evana Patterson and executive producer Nigel Godfrey. We’ve created something dynamic that the New Zealand public, and the Miss Universe family, can all get behind. Keep an eye on nextmissnz.com where we’ll post more announcements—and if you think the T-shirts (right) are as cheeky as I do, then they are available for sale online, too. Friday morning’s interview with Sonia Sly on Kiwi Summer was the most fun I have ever had on radio. Radio New Zealand National was the most fair and balanced medium I dealt with when running for Mayor of Wellington in 2010, and I was glad that Sonia thought of me for its summer programming this year. I joked to friends prior to the interview that 2011 was much like 2010: go on to National Radio to dis the Wellywood sign in the ﬁrst half of the year, and have a fun interview in the second half. This was a casual, fun interview thanks to Sonia putting me at such ease. It goes on for a healthy 17 minutes, covering my involvement in Lucire, judging the Miss Universe New Zealand pageant, my branding work, including the Medinge Group, and my typeface design career. The feedback I have had is that people enjoyed it, and I’d like to share it with you all here. Here’s the link, and you can always ﬁnd it at the Kiwi Summer page for the day, where other formats are listed. And if you’re wondering where the opening reading comes from, it’s taken from this review of the Aston Martin V8 Vantage I penned many years ago.